Location: Daon, in the Mayenne departement of France (Pays de la Loire Region). Notes: Château de l'Escoublère, is a sixteenth-century Renaissance castle located in Mayenne Daon, 2 km northeast of the town. 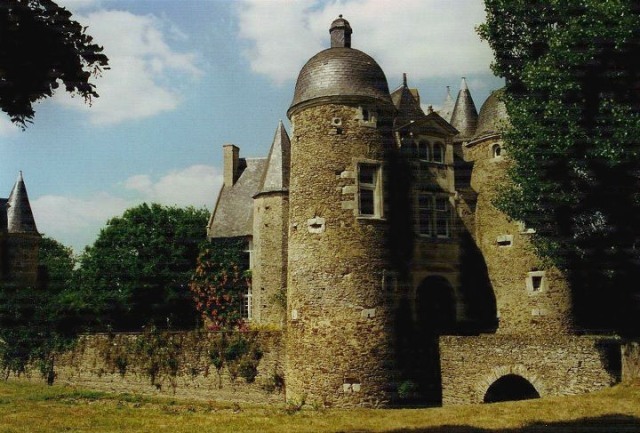 The castle, built around 1570, date on the well indicated and also the style of the building includes the castle itself, with towers at the corners and in front, and a gatehouse which addresses a wooden walkway quin replace the old drawbridge. Above the porch, a mullioned window on the cross, crowned with a triangular pediment and low, with shield in the center. The two towers have topped a bell-shaped roof of a lantern. Flukes are walled, deep, water never fails. Well, in the courtyard, is a work of art; the corners of the square edge, four composite columns with capitals support an architrave and frieze with inscription: "In te, Domine, speravi not confundar in aeternum; In justitia tua libera me "and above a nested dome. The chapel is among those whose conservation seems appropriate in the year XII.